"At the time when the authors were working on the play, a great stir was caused in Ôsaka by the birth of triplets. It was therefore decided to make use of triplets in the new production and thus it was that Matsuômaru, Umeômaru and Sakuramaru came into being. For the purpose of the story, the triplets are the sons of Sugawara's retainer, Shiratayû. When they were born, Sugawara stood sponsor to all three and named them after the trees he loved best, Matsu (Pine), Ume (Plum) and Sakura (Cherry). On their father's retirement, Umeômaru took his place as Sugawara's personal retainer. At the same time his two others brothers were found equally worthy employment, one as the retainer of Prince Tokiyo and the other in the household of Sugawara's colleague, Fujiwara no Shihei. When Shihei's jealousy brought about Sugawara's downfall, the triplets became the victims of divided loyalties" (Aubrey and Giovanna Halford in "The Kabuki Handbook"). Structure The "Hippô Denju" act is the third and final scene of the first act in the original structure of "Sugawara Denju Tenarai Kagami". It is usually staged as part of a tôshi kyôgen production. Kan Shôjô was ordered by the emperor to chose his heir in the art of calligraphy. He couldn't think of anyone except his former student Takebe Genzô, who was banished because of a love affair with Tonami, who had been an employee of Kan Shôjô's household. Kan Shôjô summoned Genzô and got the notice that he would arrive here today. Mareyo, who is a disciple of Kan Shôjô, is fully confident that he will be the chosen heir. Genzô arrives at the palace with his wife Tonami. Poorly dressed, he is the shadow of his former self. They are kindly welcomed by Kan Shôjô's wife Sonoo-no-Mae and the lady-in-waiting Minase. Genzô feelings are mixed with joy and fear when he is told that Kan Shôjô is ready to meet him. He comes alone to the room of learning, without Mareyo. Kan Shôjô asks Genzô how he has been after he had to leave the palace. Genzô answers that he has opened a village school to teach calligraphy to local children. Kan Shôjô is satisfied to hear that Genzô didn't forget the calligraphy that he had learned before. Then, he orders Genzô to write an example of his calligraphy. Although Mareyo comes on stage to interfere with Genzô's writing, Genzô manages to finish it. Kan Shôjô sees the sheet with pleasure and says that he will appoint him as his official successor and gives him his calligraphy book, a scroll full of secrets. Genzô is very glad, because he thinks to be allowed to join back Kan Shôjô's household. His former master says that of course Genzô has become the heir, but that it is a different problem to forgive his past love affair. Genzô cares more for Kan Shôjô than for the Imperial Court privileges. Yet, Kan Shôjô refuses Genzô's wish and asks him to leave the palace soon. Genzô is very disappointed because he is ordered not to appear in front of his former master anymore. A messenger comes to say that there is a summons from the emperor for Kan Shôjô. The "Right Minister" doesn't know what it means. Kan Shôjô enters his private apartments. His wife Sonoo-no-Mae is back on stage, with Tonami hidden behind her outer coat as she would like to see her former master for the last time. Kan Shôjô, dressed with the official Imperial Court dress, is back on stage. When Kan Shôjô leaves the mansion, his Court hat suddenly falls off. It seems to be an evil omen. 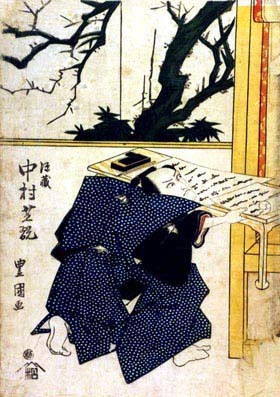 Genzô, his wife Tonami Sonoo-no-Mae are all worried for Kan Shôjô as the nobleman goes down the hanamichi. Mareyo is back and tries to steal the precious book from Genzô's hand. Genzô takes back the book and threatens Mareyo to kill him if he ever tries again. Genzô knows that the longer they stay the harder to leave the palace. They bow to Sonoo-no-Mae for the last time and humbly asked her to try to intercede one more time in their favor. Umeômaru comes rushing to the gate of Kan Shôjô's mansion. He shouts that his master Kan Shôjô has been apprehended and is being brought back to the mansion now. Kan Shôjô arrives on stage, guarded by armed men. 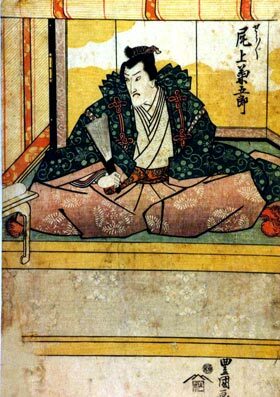 The evil Fujiwara no Shihei used the secret love affair of prince Tokiyo and Princess Kariya (check the previous act for more details) as a tool to make the downfall of Kan Shôjô. He ingeniously built the following fictitious incident: Kan Shôjô plotted to replace the present emperor with prince Tokiyo and intended to make Princess Kariya marry emperor Tokiyo in order to seize power. At a result, Kan Shôjô was accused of plotting the abdication of the present emperor. The emperor accepted the false accusation made by Shihei and decided to send exile Kan Shôjô into exite to Kyûshû. Mareyo, who has gone to the other side, tries to beat Kan Shôjô as a criminal. Umeômaru is about to strike back in order to help his master, but Kan Shôjô stops him because he refuses to defy any of the emperor's orders. Umeômaru keeps his patience unwillingly to prevent expanding Kan Shôjô's punishment. After Kan Shôjô goes through the gate of his mansion with Umeômaru, the gate is completely closed. Then, Genzô and his wife Tonami appear on scene. They have hidden themselves because they worried about Kan Shôjô. Genzô strikes the armed guards and knocks Mareyo down. Genzô was already banished and he has officially no more relationship with Kan Shôjô, so he thinks that nobody can hold Kan Shôjô responsible for Genzô's fights. He manages to drive off the armed guards and knocks the barred gate. Umeômaru suddenly appears on top of the wall. Genzô suggests to take Kan Shûsai, who is Kan Shôjô's little son, to a safe place. He is persuaded that Kan Shûsai might be killed and that the mansion is no more safe under these circumstances. Umeômaru agrees with Genzô and passes Kan Shûsai over the wall to him. One of Shihei's spies is discovered and immediately. Genzô and Tonami walk down the hanamichi, secretly bringing Kan Shûsai back to their village.